Say hello to Sarah York! Sarah is the owner of and maker at Bell Mountain Naturals, purveyor of all natural, sustainable soap and skin care. She's located in Manasquan, NJ. Sarah started Bell Mountain as a side hustle in 2012, and it became a full fledged business in 2015. A fun little fact about Bell Mountain Naturals is that it's named after the street her aunt lived on in Austin, where she started making soap. I love a name with a good meaning behind it! If you're just starting a business of your own, keep reading to learn some helpful tips from someone who's been there. AND take advantage of a special discount that Sarah generously offered to my readers! The first time I was introduced to soap making, was in a college chemistry class! I loved the idea of combining science and art. I revisited soap making as a hobby a few years later with my aunt (I come from a long line of women artists and makers). I fell in love instantly. Oh man! I could probably right a book! haha! Being the maker is the fun part, but such a small aspect of running a business. I wish I would have spent more time in the beginning with bookkeeping and other business related things. It would have saved a lot of headaches! What has been the most effective strategy for gaining new customers or selling more products? Our most effective strategy has definitely been using social media! Specifically Instagram. We've been able to meet customers both wholesale and retail that share our passion for natural and ethical skincare. Also, having a clear, strong idea of what our brand is. SO important! Best part for sure is watching it grow, It's like my baby! Finding balance. Running your own business, you never clock out. Since we are small, I still wear all the hats, and there is always something that needs to be done. You HAVE to love what you do. That passion carries you through all the challenges of starting/running a business! Thanks so much for sharing your wisdom and offering a discount on your lovely products, Sarah! Visit the site here to purchase. Follow on Instagram here. Today's interview will really make you glad it's spring! Mandy Leckie, owner of Treasured Peach, makes the most adorable felt flower items for children, from headbands, to garlands, to mobiles to name a few. As she put it in her own words, "I create items for magical childhoods and treasured moments with your littles". Mandy's located in Alberta, Canada. She's been in business for just over a year, which is very impressive considering all of the high-profile places where her products have already been featured! If you're a small business owner or interested in becoming one, keep reading to hear Mandy's advice on the topic. I started sewing for my children and friends and family. It was really my daughter who started what Treasured Peach is today, when she asked me to make her flowers for her room. I wish I knew that you can't confuse your clients by selling everything you make. I think as creatives we are so multi-talented that it's hard to narrow down to selling one of the mediums we use. Quality photographs and a narrowed focus of what items to sell definitely changed my shop for the better. I saw an increase in sales, since clients could see how to style my items. For photos, a white background photo is a must for listings, that is essential to learn. Find a few tutorials on YouTube and practice all you can. The other essential is a lifestyle photo so your clients can imagine how to use or style your piece. I started out with a non-existent budget. So I searched my area's community and mom Facebook groups for beginning photographers who needed to build their portfolio. I got free photos, they got samples of their work. Win-win! And I kept getting free pro-styled photos because we held events for members of the community to model for me. If the client wanted the pictures, they paid a discounted rate to the photographer. All participants had to sign a release for both parties to use photos in marketing materials. Now, I don't have the time to plan those events. But it was a great way to start, low cost and so much fun! There are so many things I enjoy about running Treasured Peach, but the best part is the freedom to be a stay-at-home mom and be there for my family. This is such a family business because my daughter models my accessories, everyone helps wrap orders for shipping, and my kids absolutely love mail day when get to drop off orders at the Post Office. We live in a small town so the ladies at the Post Office are so sweet and great with my kids. As much as it's awesome to stay at home with my kids and serve clients at the same time, it can be difficult some days. Balancing time and my energy to give the best to my family and my best service to my clients, has taken the most time to learn a flow that works well. Figure out your favorite thing out of all your talents that you could make over and over again, even late into the night. That passion will draw in clients and pull you through the rough days. Things are always changing with SEO, social media, and trends. To stay at the top, you need to constantly be in a state of learning and working on improving yourself as much as improving your business. Today I have the opportunity to introduce you to small business owner, Kim Sievers. I didn't know this when I originally scheduled the interview for today, but it also happens to be her birthday! Happy Birthday, Kim!! Kim is the owner, purchaser, and designer behind The Lemonade Stand, an online children's clothing store, with seriously adorable clothes! She is also a full time mom of a three year old and four month old, and a dayhome owner. She's located in Edmonton, AB, Canada. She started her business about two years ago. It was inspired by her daughter. Kim found it so hard to find unique, fashionable, and most importantly affordable clothes for her and wanted to change that. I think she certainly has done that! Keep reading to learn more about her experience as a small business owner. My shop first started with a small dream, a lot of research, and sending off a lot of emails. I had a few brands I loved that I knew I wanted to carry (a lot of which didn't end up doing wholesale), but aside from them I researched a lot of different brands, and made a lot of personal purchases so I could get a feel for quality and such. The full extent of how much competition there is out there. I mean I knew it was a competitive field to get involved in, but it felt like once I committed and put money into it, ten new shops were popping up every week. What has been the most effective strategy for getting new clients or selling more products? I try to make a personal connection with my customers. I like my Instagram feed to be real. Lots of shops have these dreamy photos that look so magical and they are amazing, don't get me wrong, but I want my customers to see the items I carry being worn by real kids, doing real kid things. Being able to work from home and watch my kids grow up (cheesy I know). Seeing the light at the end of the tunnel. As a new(ish) shop in such a competitive field, it's sometimes disheartening seeing the success of other shops exceeding mine. Statistically a new business is in debt for the first few years of business, so I know I'm not alone. It's hard to keep motivated sometimes...but every kind word from customers or cute photo shared in my gear makes it easier. Do your research!! In relation to my business; I THOUGHT I did a lot of research...researched other kids shops in my area and internationally, looked to see who carried what and what was popular, and even made a lot of personal purchases just to test out quality. But even after all of that, I found there were A LOT more shops, even within my own city, that didn't necessarily advertise a lot so I never came across them. With certain brands I learned a lot of them (although great brands), just cared about their end of the business. So they didn't really care if they had six different stores within the same city selling the same stuff; which makes it really hard to sell things when you've got so much surrounding competition. This week's interview is with Penelope Duke. She is a ceramicist based in the Dandenong Ranges on the outskirts of Melbourne in Australia. The pottery she makes is functional and practical, meant for use in everyday life. She's been in business only a couple of years, and admits she still has much to learn, but she graciously shared what she has learned so far. I absolutely love the simplicity and organic nature of her pieces! Keep scrolling to take a look for yourself. I started a night class at a local pottery school one night a week where I was lucky enough to have Kevin Somerfield as a teacher. It was really hard waiting a whole week for the next lesson, but after about a year I was very fortunate to be gifted a wheel and kiln from a retired potter, so was able to set up my own studio at home. Everywhere in the natural world. I like elegant form and simplicity, and that can be found everywhere, from the texture of bark to sand, and the shape of hills, shadow and light. How many late nights I was in for! What has been the most effective strategy for gaining new clients and selling more products? My only marketing tool is Instagram. I have not had to look for clients, they have found me through that. I suppose that being such a visual business it is really easy for people to see exactly what I am offering just by looking at my page. I make sure that I have a cross section of my work on display on my Instagram page at all times. The freedom to keep being creative, and to allow my own ideas to form gradually. There are no restrictions on what I can and cannot do unless I put them there myself. Also the flexibility to work around my family. There are no restrictions on what I can and cannot do unless I put them there myself. As a mother I have found it a battle between wanting to be wholly there for my children, and wanting to throw everything into growing my business. It is such a juggle. Also finding that discipline to turn away visitors who might call in when I have set time aside to work, and putting my blinders on and just getting on with it when there are so many other things that would like my attention. I would like to reach a point where I can be running a self-sufficient studio, and where my brand is recognised to the point that there is consistent work. Today's interview is with Jess Sternberg, co-owner of the ethical fashion brand, Free Label, with her partner Julian Hoyle. Free Label offers incredibly stylish, casual, everyday pieces that you will definitely want to add to your wardrobe. I sure do! Free Label was started in July 2015 in Toronto, then moved to Vancouver in March 2016 and is currently operating in its fourth season. Fun fact: the first piece, the Betty Tank, is named after Jess's mom and they've been making it ever since! I'd like to think it was fate! At the time, I was the manager and buyer for an activewear boutique in Toronto called "Flow-Active" that specializes in Canadian and ethically made brands. I was constantly on the search for ethically made pieces that were great for both yoga and everyday use, and had fits to flatter the average woman; I was looking for what I would call "easy sell pieces." That it takes time to figure it all out. Starting a business is incredibly intimidating - the financial responsibility alone can be overwhelming. But after a couple season's you start to get the hang of the timing, you start to build a network of reliable suppliers and retailers, and you start to gain confidence in yourself and your business. Free Label started out with just one style (the Betty Tank) in two colour ways. This Spring we have 14 different skus. 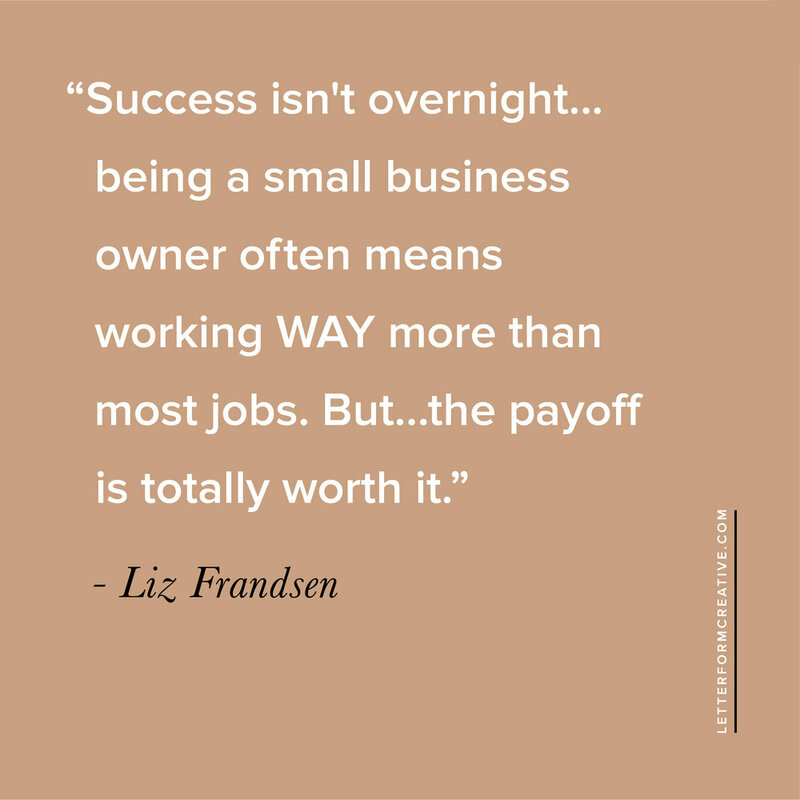 It just takes time to build the business—slow and steady, baby! What has been the most effective strategy for gaining new customers and selling more products? Instagram and word of mouth from a repeat customer base. I think building a friendly and approachable brand that followers/potential customers can engage with on a public platform is really important in ethical fashion. It is still a small industry with a niche following, so interacting with those people, answering their questions, and gaining their trust through transparency is vital. There is no better feeling than accomplishing something just for you. Of course its rewarding to do a great job at work and have your boss praise you, or get a raise. But to do a great job FOR yourself...it doesn't get better than that! Taking the job home with you! Unlike most 9-5 jobs, you can't just "leave it at work." I'm constantly checking my phone, answering emails, and visualizing the next collection and mapping out the next steps. There really is no break from the mental and emotional connection to the business. (This is something I need to work on). You can do it! All you need is a massive amount of passion, and the motivation to learn and do. Seriously...you can do it. One of the biggest arguments against shopping ethically is the cost. To buy ethically made clothing is much more expensive than picking up a t-shirt at a big box store, but it truly truly is worth it. There are a lot of costs that go into consciously making a garment. We hire local pattern designers to draft our patterns, digitize them, grade them, and turn them into markers. Then we bring in fabrics made from natural fibres and coloured with eco-friendly dyes - you can imagine this is a much better alternative to buying synthetic fabrics treated with chemicals. Next, the markers and fabrics are brought to a local factory where the sewers construct the garments in a safe and clean environment. These workers are all paid fair wages and receive benefits. When you buy an ethically made garment, the price is not marked up ten fold like in big box stores. In fact, the margins are really slim and your money is really going to the people that take part in making that garment. If you commit to buying fewer garments and choose high quality and ethically made pieces, you feel a much deeper connection to the things you wear. I absolutely LOVE doing these small business interviews! It's so much fun to hear how other people started their business. There's also so much comfort knowing that there are other small business owners who have the same struggles. That's how I felt after hearing from Amelia Clay, owner of Verão Sandals. Her sandals are absolutely gorgeous and timeless. The perfect sandal you'll want to live in all summer long and you can because Amelia has generously provided a discount to my readers! Read on to learn more about Amelia's small business journey and to take advantage of that special discount. I caught the entrepreneurial spirit at my first job. It was a daily deal website just for women and it was my job to bring on new small businesses.Working with these new business owners really inspired me to do it on my own one day! From traveling , I use traveling to challenge me, inspire personal growth and make some amazing friendships. I've lived in 8 different countries thus far. Additionally other business women. It's always nice to know that your not going through this alone and that other women have experienced the same! Patience! I once believed everything would happen overnight and that if you threw up a website with a great product people would come and sales would fly in. I was wrong :) It takes a lot of dedication, consistency and patience to see success. Really learn to enjoy the journey to the goal you've set out, celebrate the small wins, still make time for your personal life and keep at it! Looking back it's a welcoming thought to see how far we've come. Word of mouth and customer referrals. I wear the sandals everywhere and keep cards and a cute colored pen in my purse that have room to scribble a special discount code on, so it feels personal when I hand it out :) I try to start up a couple conversations a day! Also treating every sale with great care and include an easy way for them to pass on a referral discount to a friend. The personal growth tied to it, learning to be a true #ladyboss ! At the start I used to complain about it being so much work, and this and that was hard, I couldn't do it. I had lost a wholesale account or couldn't pay my bills on time. I was always very excited to have Verão and to be doing a dream, but I was not really stepping up to the plate and owning the situation. I wasn't really proud, if that make sense any sense at all. Sure, I had these beautiful sandals and was living a dream on the outside with this new brand, but behind the scenes I was dirt broke and really struggling to keep it going. Once I learned to own the situation, everything changed. I was not a victim these were my choices and sacrifices I had made to reach a dream and if I was patient it would pay off. This simple change in outlook has made a world of difference and carried through to my personal life! I have a lot more confidence and it shows. For me it was the financial part in two components. 1. Organizing Verao's Finances and still putting money aside for my personal life. Looking back I could have planned this a lot better and been a bit more realistic about costs. I could have probably saved a larger nest egg before just going for it and hopping on a plane to Portugal. Quickbooks self employed app has done wonders to better organize this. It even tracks mileage and organizes all your receipts expenses so you are keeping proper track. 2. Having to stick to your guns about placing value on your work and charging for it respectively. I was so excited in our first summer that people even wanted to wear the sandals and I think I could have been renamed "Miss Free Sandals". I was giving them away at $20 a pair and to anyone who did not want to pay the real price, I offered up a strong discount almost immediately. It took awhile for me to take off the owner hat and step into, I guess, a more sales role, putting the value in all the work it took for that finished of pair sandals to land into someone's hands. 100,000 happy pairs of feet in 5 years. To be a self-sustaining, profitable business in the next 2 years. To have Oprah or Ellen wear a pair of Verão's! Be a sandal on the shelves of Bergdorf and in Net-A-Porter by year 4. Build a mentor group of other business owners. A nice, open space where you can put your guard down and ask real questions you need help on. Keep an open mind we are not in competition with each other and we can all learn from one another's experiences. Also, when you are starting out, don't have business FOMO, fear that starting something might lock you into that idea and maybe that was not the best business to build. You simply just need to start somewhere and during that time give it your all. Don't worry that you're missing out on a better idea. I promise you, you're not missing out on anything and the experience gained from building that first business that might not work, will only put you in a better position as you build the next one. Additionally, businesses can always pivot, evolve, grow. You have got to have a starting block though to be able do this :) Two years ago we started out selling Turkish towels until we found the right sandal manufacturer. Thanks so much for sharing and for the generous discount, Amelia! Be sure to follow along with Verão on Instagram. Use code: Letterform for $26 off any pair of sandals! Visit the site here to purchase.